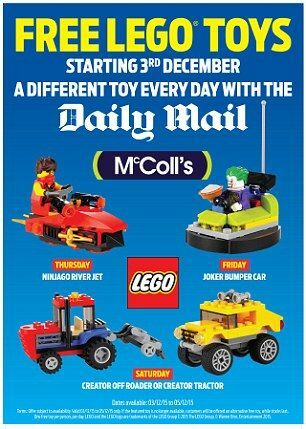 It has been a while since the daily mail have had a promotion of free lego toys, but from the 3rd December until Saturday 5th they are giving away 4 lego Polybag sets. This offer is exclusive to McColl’s stores. Which for me is great as our newsagents just across the road is now a McColl’s shop, saves me having to travel 7 mile round trip to a WhSmiths. The offer is the same as previous offers, just buy the daily mail, and take the voucher printed inside to participating McColls and receive you free lego toys just in time for Christmas. Please note that if the featured LEGO® toy is no longer available, you will be offered an alternative free LEGO® toy while stocks last. I have just got Thursdays paper and they gave me a choice in the shop of girls or boys, the sets that I had were Disney Princess 30116 and city digger 30312. So these completely different than the ninjago set, so could even be different where you are. HERE is the link direct to the daily mail offer page.